Take a day trip in one of the most beautiful surrounding areas of Madrid: Segovia! If you like History and love food, this is the perfect day for you. Join your private guide for a day in beautiful Segovia; the Treasure of Castilla and the former capital of Spain. 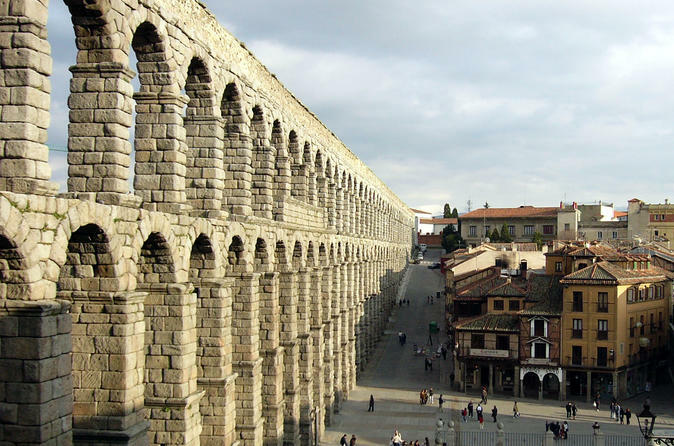 It has the best Roman Aqueduct and an ancient medieval city where you can see the 3 cultures: Arabic, Christian and Jewish which made Segovia in a great wonderful location. In this tour you'll explore more than 2.000 year of Spanish history from the Romans, to the House of the Catholic Kings, Isabel y Fernando, where they organized the travel with Christopher Columbus to go to America. It’s like a real travel in time. Next to that, Segovia also has got one of the best and most delicious cuisine; Worldly famous are the suckling pig and lamb roasted in stone medieval oven among many other traditional dishes and wine Segovia and Castilla have to offer. Sounds delicious right? Our day trip won't be complete unless we have a Segovian meal in one of the best traditional restaurants in town, where you'll get insights into the way of cooking, the products, and the exquisite Ribera del Duero wine: one of the best wine regions of Spain. We meet at the great Plaza de España next to the of Don Quijote statue. I will tell you about Cervantes while we walk up to nice Calle Princesa to the Moncloa bus station. We'll travel to Segovia from Madrid & back by comfortable bus. This way, you'll even be able to enjoy the beautiful nature & scenery during our journey. Both tickets and lunch is already included into the price for you, so nothing to worry about except your souvenirs!